The county of Shkoder is divided into 3 districts: Malesi e Madhe, Puke, and Shkoder. Its capital is the historic city of Shkoder, and on the southwestern border lies a small shoreline on the Adriatic Sea. Skhoder City (also known as Shkodra) (pop: 90,000) is one of the oldest cities in Albania, a true cultural gem, with 2,400 years worth of interesting cultural heritage. The city is the heart of Albanian Catholicism and Sunni Islam. There are palatial merchants homes and magnificent mosques and Catholic and Orthodox churches. It is nestled between the historic Rozafa Citadel, the Albanian Alps, the sandy shoreline of the Adriatic, the serenity of the Buna river delta, and the deep sapphire waters of Lake Shkodra. 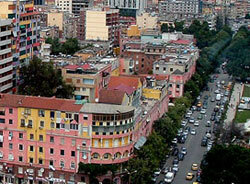 The city is a major artery of Albanian culture. If you would like to breathe history and live amongst some of the most culturally fascinating sites in the country, Shkoder City is for you. Shkoder City is one of Albania's most cosmopolitan cities, and one of its more prosperous, with flourishing textile, food, and electrical components industries. It is an important educational centre, and one of the centres of Albanian intellectual life, being home to the Pedagogical Institute and the Luigi Gurakuqi University of Shkoder. The city was badly damaged during the Second World War, but was rebuilt with several new quarters with wider streets and residential buildings. Some of its lovelier quarters include Serresh and Gjuhadol, blessed with natural scenery and culturally-relevant structures. Around Shkoder, travelers can explore the historic Turkish Bath, and the Lead Mosque. There's the largest, stadium in the country: the Loro-Boris Stadium. Shkoder is a good base to reach the nearby town of Sarda, where travelers take a motorboat to visit the town's medieval ruins. Despite its many historic monuments, the air of antiquated gentility that surrounds Shkoder centres upon its most characteristic structure: the Castle of Skhoder. Also known as the Rozafa Castle, the legendary Illyrian castle was named after a young bride Rozafa. Its took centre stage during the First Balkan War, when it was protected by the Turkish generals Hassan Riza Pasha and Essad Pasha. Today, Shkoder receives an increasing amount of visitors. There are good htels and restaurants.